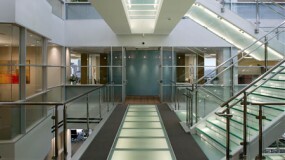 Dependable Glass Works manufactures specialty glass products. Architects and design professionals can create distinctive designs with the “Cast in Place Resin” (CIP) lamination. Glass vanity tops can be customized to match sinks or color décor of your bath for a one-of-a-kind environment. 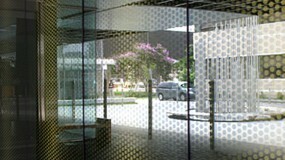 Dependable Glass Works is a licensed fabricator of Safety Plus® II Hurricane/Impact Resistant Glass. Our glass stair treads and floors are specifically engineered for safety and durability, to comply with your local building codes and ADA slip-resistance regulations. 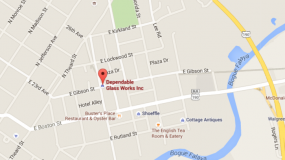 Dependable Glass Works is proud to be a leader in the glass industry. For 50 years we have serviced local and national clients from our downtown Covington, LA location. Architects, contractors and home owners have called on our experience, innovation and cutting-edge technology to create beautiful designs in glass. Look through our project gallery to see the variety of projects. From the fabrication of beveled edged mirrors and glass to counter tops and table tops, to glass stair treads and flooring; from hurricane resistant and bullet resistant glass to architectural decorative art glass, windows and walls we can service your needs. 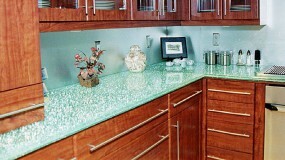 We have the largest inventory of textured glass in the Southeast. Our innovative staff can help you create a design that is custom made to meet your requirements, or we can help by refurbishing the existing glass and mirrors for your business or home. Tour our site to learn more about Dependable Glass Works or call our sales representatives to let us help you with all your glass needs.